Girls Middle School Soccer Wins League Championship! 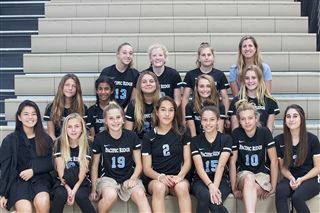 The middle school girls soccer team won the South Coast Middle School League Championship on February 8. It’s the second time the team has won the league in the past three years! The first goal against Bishop's was scored at the 7-minute mark by Bailey Lapidow off a free kick by Danielle Frank. Danielle scored the second goal, with a rocket shot just outside the box that ricocheted off of a Bishop’s player into the net. Firebirds were up 2-0 at the half and held their ground to take the win. Goal keeper Madeline Del Toro had 4 saves in the second half to secure the shutout. The Firebirds finished the season undefeated!